Sierra Club Florida News: More Drilling in the Gulf? More drilling in the Gulf? Tell BOEMRE to consider alternatives! Almost one year ago, the BP oil disaster demonstrated that our approach to oil and gas production was fundamentally flawed. The President's Oil Spill Commission found that these shortcomings were not unique to BP's Deepwater Horizon but signaled systemic problems within the oil and gas industry. Send a message to the Bureau of Ocean Energy Management, Regulation and Enforcement (BOEMRE) telling them our country needs move beyond oil! BOEMRE is currently seeking public comments on two Environmental Impact Statements (EIS) that would allow new oil drilling leases off our coasts. However, the Oil Spill Commission's recommendations have yet to be adopted and implemented by Congress, leaving our shorelines and coastal communities still vulnerable to tragedies like the BP oil disaster. 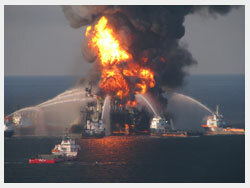 Until this happens, no new oil leases should be granted, especially in the Gulf of Mexico. Tell BOEMRE that until the proper protections are in place, no new oil leases should be granted! While the oil industry would like us to believe that dirty fossil fuels are the only option for our energy and economic needs, there is no reason why the Gulf Coast cannot lead our country into a clean energy economy. The best way to protect the Gulf and other U.S. coasts from future oil disasters is to wean our country off of dirty fossil fuels and make real investments in clean energy. If we choose to learn from history, the BP oil disaster can serve as a catalyst to launch our nation towards a cleaner, more sustainable energy future. Thank you for all that you do for our Gulf Coast.